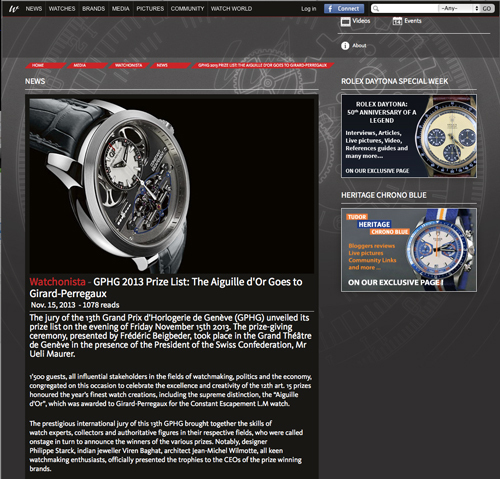 The jury of the 13th Grand Prix d’Horlogerie de Genève (GPHG) unveiled its prize list on the evening of Friday November 15th 2013. The prize-giving ceremony, presented by Frédéric Beigbeder, took place in the Grand Théâtre de Genève in the presence of the President of the Swiss Confederation, Mr Ueli Maurer. 1’500 guests, all influential stakeholders in the fields of watchmaking, politics and the economy, congregated on this occasion to celebrate the excellence and creativity of the 12th art. 15 prizes honoured the year’s finest watch creations, including the supreme distinction, the “Aiguille d’Or”, which was awarded to Girard-Perregaux for the Constant Escapement L.M watch. The prestigious international jury of this 13th GPHG brought together the skills of watch experts, collectors and authoritative figures in their respective fields, who were called onstage in turn to announce the winners of the various prizes. Notably, designer Philippe Starck, indian jeweller Viren Baghat, architect Jean-Michel Wilmotte, all keen watchmaking enthusiasts, officially presented the trophies to the CEOs of the prize winning brands. Organised as a live link-up broadcast with New York and simultaneously translated into English for enthusiasts around the world, the ceremony was streamed live on Euronews.com, Worldtempus.com and on the official GPHG website, Gphg.org. A highlight of the international watch industry calendar, the Geneva Watchmaking Grand Prix is a yearly salute to the excellence of global watch production and thereby contributes to promoting the influence of watchmaking and its values around the world. These values are shared by the main partner of the GPHG Foundation, the Edmond de Rothschild group, which has since 2011 annually rewarded the best student at the Geneva Watchmaking School by granting a scholarship. This year, the travelling exhibition presenting the watches pre-selected by the jury featured stopovers in Beijing, Macau, Dubai and Geneva. To conclude this 13th edition, the prizewinning watches in the various categories will be on show from November 21st to 28th at L’atelier by the Hour Glass, in Singapore.